News from LMCU: Max Checking turns seven! It’s been seven years now since we introduced Max Checking to our members. 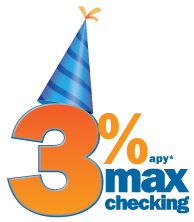 Since Max began, over 80,000 new accounts have been opened, paying out nearly $33 million in interest dividends! Max Checking is totally free and pays 3% APY* on balances up to $15,000 and refunds up to $15 per month in surcharge ATM fees for non-LMCU ATM use.